Infusion Therapy｜Business and Products｜KAWASUMI LABORATORIES, INC.
Kawasumi has been designing and producing high quality and low cost Infusion Therapy products since 1958. 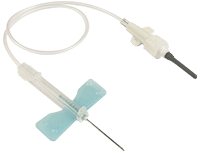 Adapting quickly to the global requirements for anti-needle stick safety devices, Kawasum's latest line of products – K-Shield Advantage – are some of the highest quality, cost-effective needle-safety devices on the market. Winged Blood Collection set has variation with anti needle stick protector "K-Shield Advantage". This excellent anti needle stick protector can be activated by very simple and easy step. The simple structure makes whole device very compact even with needle stick protector, so it does not take much space in a hospital room. Since being launched in U.S.A, where anti needle stick device adaption is most developed, this device has been highly evaluated.